The work day in the etrog orchards of Gioia starts at sunrise and continues until one in the afternoon when the blazing Calibria sun drivers the farmers indoors. 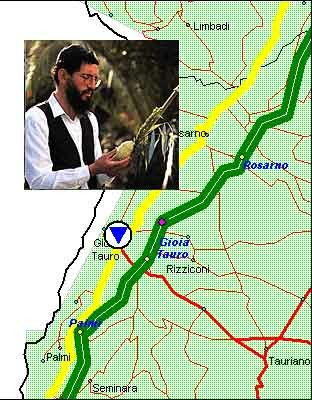 Each summer, since 1962, Chabad emissary Rabbi Moshe Lazar leaves his home in Milan and travels to this southernmost region of mainland Italy to begin the task of contracting with the local growers and harvesting the purchase of thousands of etrogim required by Jewish law for Sukkot. Along with his wife, Yehudis and their children, Rabbi Lazar supervises the picking of the early etrogim in late July, and proceeds with the smaller ones, harvested in late August and early September. "We have it on tradition that Moshe Rabbenu sent messengers on clouds to this part of the world to get these special fruits," explains Rabbi Lazar. "Out of the thousands of etrogim growing in each of the orchards of Calibria you find only a few hundred that are really acceptable for Sukkot." Rabbi Lazar guides the local hands in selecting unblemished fruits with the "pitam," the end of the sten, intact. Each year he signs his contracts with different Calibria farmers, as the etrog crops vary widely from one year to the next. Each year more than 35,000 etrogim from are harvested by Jewish buyers in this mountainous region, between the Ionian and Tyrrhenian seas. When the Lazar first began his work in Gioia almost forty years ago, there were hundreds of etrog orchards. Today the number has dwindled to less than twenty, as orchard owners have switched to other crops. "Years ago etrogim were grown to make candied fruits that were sold around the world, in addition to meeting the Jewish community's demand," recalls Milan Chabad Center co-director Yehudis Lazar. "Today those businesses have closed down and Jews are the only ones still purchasing the fruits from Calibria. In fact, we buy up much of the excesses and make etrog liquor and other products simply to keep the remaining etrog growers in business."